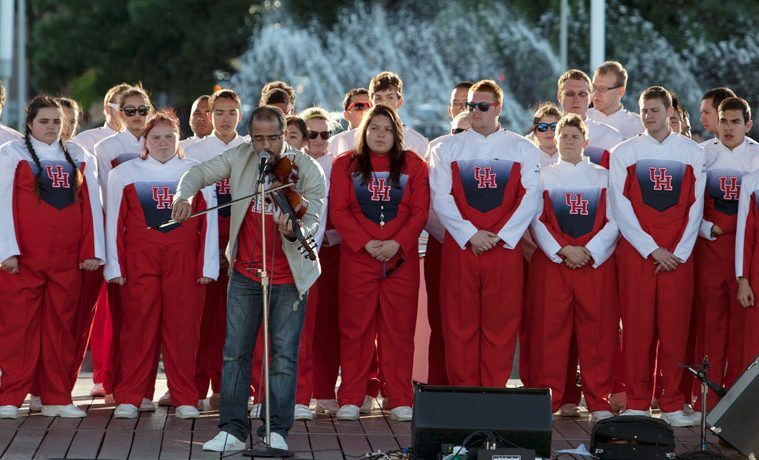 IMAGE: UH Cynthia Woods Mitchell Center for the Arts’ Artist in Residence Daniel Bernard Roumain with the UH Spirit of Houston Cougar Marching Band, in Discovery Green Park in Houston, TX during En Masse, a four hour long public performance on April 20, 2013. Photo by David A. Brown. The season is off and running. At press time, Texans and Cowboys are off to an OK start, the Mack Brown drama continues, and Johnny Football had three seconds on the bench. Oh, yeah, that other season started too. So what’s my cheeky point here? Why do we often position sports as the enemy of the arts? Rice University’s Kinder Institute for Urban Research’s Houston Area Survey on Health, Education, and the Arts asked participants about attending either sports or arts events. This is Texas, people; why not see who’s going to both? Example: I see a guy take out his phone out during the intermission at Houston Ballet. “What’s the score?” I asked him, knowing full well he was checking on the UT game. A lady in Row D chimed in on the tragedy of arts events occurring on Aggie game-days. When Horse Head Theatre launched, artistic director Kevin Holden mentioned “no shows on UT game days” alongside his promise to present raw‑to‑the‑bone theater. NobleMotion Dance in Andy Noble’s Maelstrom. Photo by Lynn Lane. But where’s the requited love? Why doesn’t the sports field pay attention to us? “Not so fast,” says my colleague and associate editor at Dance Magazine, Jenny Dalzell. “One could argue that this bridging of sport and art happens on Dancing with the Stars, in the way that athletes, like Hines Ward, Emmitt Smith, Apollo Ono, and recently Jacoby Jones, are finding out what it means to be in a dance studio and training,” says Dalzell, who just happened to have a super blog post on this very subject. How true, and who didn’t enjoy Ono’s finesse off the ice? Dalzell reminded me that Lynn Swann, pro football Hall of Famer and Pittsburgh Steeler wide receiver, danced with Twyla Tharp and then New York City Ballet star (now director) Peter Martins in Tharp’s Dance is a Man’s Sport, Too, a made for TV dance in 1980. She also brought up the fact that more recently, Mike Piazza, considered one of the best-hitting catchers in history, played a hit man in a Miami City Ballet production’s of Balanchine’s Slaughter on Tenth Avenue. Why don’t these two worlds collide more often? Just think of the pageantry and ritual surrounding sports events, everything from those weird diagonal walks that marching bands do to the 100-girl kick lines of dance teams. Consider The Kilgore Rangerettes, the nation’s first dance team launched in 1930 by Miss Gussie Nell Davis, who brought the first touch of Broadway to half time. If anyone is going to make a sports/arts connection, it’s Texans. Kudos to University of Houston’s Cynthia Woods Mitchell Center for the Arts for commissioning En Masse, Daniel Roumain Bernard’s collaboration with UH’s Spirit of Houston marching band. DBR will return for another new work for the band for the opening of the new football stadium in 2014. I appreciate the Mitchell Center’s embrace of art and college life. Bravos are in order to The Dallas Opera for the simulcast of Turandot at the Cowboys Stadium last April. Let’s share our theaters. Houston’s Mercury-the orchestra re-defined played before Astros and Aeros games. That’s the spirit. Of course, there’s much about these worlds that collide. We are an art form not a competition, although looking at the rise of dance competitions that is less true these days. But hey, listen to Paul Taylor Dance Company member Francisco Graciano on the subject. 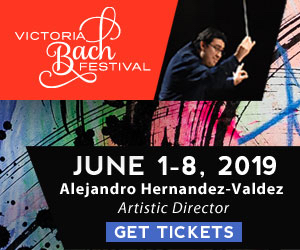 “If you think professional sports are inspiring, then go see Taylor,” says Graciano, who will be performing in Houston at Jones Hall on Oct. 12. Any sports player would be hard pressed to keep up with the athletes of God from the Taylor company. Now, if only the touchdown dance would come back.